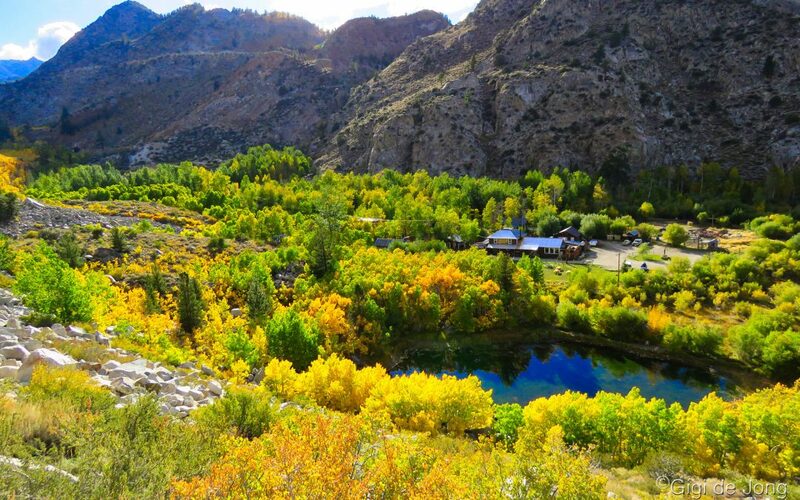 The Cardinal Mine, located on the North Fork of Bishop Creek just above the settlement of Aspendell, is a fascinating relic of gold mining in the Eastern Sierra. It is easily accessible from the Cardinal Village Resort and offers insight into the hardship and heroics of the men and women who shaped the early development of this ‘golden state’. The history of mining in California is long and legendary. It all started with the discovery of gold near Sacramento in 1848. By 1849 the ‘California Gold Rush’ was in full swing and prospectors were scouring the entire region. It was soon evident that most of the richest gold deposits were in the Sierra Nevada and Cascade Mountain ranges. Thousands of mining claims were established and a few fortune seekers achieved their dreams, but the majority worked hard just to sustain a meager living. By 1855 the rush by individuals to prospect for gold and other minerals slowed dramatically. Prospecting and mining continued throughout California and, as more deposits were discovered deeper underground, more sophisticated and more expensive equipment was needed to extract the ore. In 1885 gold was found at the North Fork of Bishop Creek and the Bishop Creek Mining District was officially formed in 1886. Cardinal Mine began from a small claim by two brothers, Felix and Charles Meyerson, who found gold near the headwaters of the Middle Fork of Bishop Creek in 1890. They called it the “Tip Top” mine and worked the claim for 5 years. In 1895 the mine was sold to a consortium of investors from New York City. For the next 10 years, limited mining activity took place, but in 1905 the company was fully formed as the “Bishop Creek Gold Company” with a capital stock of 5-million dollars. In 1906, a man whose name is synonymous with Southern California’s economic development, Henry Gaylord Wilshire, became the company’s secretary/treasurer. He began extensive development of the mine. The mine was a large, impressive operation in its day. Deep shafts were drilled and tunnels dug under the cliff comprised about 4,000 feet of excavation underground. The main shaft went vertically into the earth for 100 feet and a further 500 feet was dug at an incline. Other shafts were drilled higher up the ridge. Numerous tunnels extended at various levels from the shafts with the longest tunnel, at 200 feet below the head of the main shaft, extended for 1,400 feet – completely under North Lake! The entire operation from extracting the ore from the earth, to crushing, milling, grinding, concentrating, and adding chemicals to produce the gold slurry, which was then drained, dried and bagged was all done on site. The resulting 125lb bags of quality gold bearing supply were shipped to the smelters in San Francisco. It was an adventurous operation in a very remote and geographically challenging setting. This complex operation required hard-working and courageous people. The village that was built and maintained by the company and its workers was known to be like one big family. Some remnants of this famous and once-profitable mine are still visible and accessible by a short trail from Cardinal Village Resort. A few of the original village structures have been restored and are now used as the guest cabins at the resort. The area is especially great for families with kids of all ages. The opportunity to explore and learn about the past and how it has shaped our present is great for all enquiring minds. It is the perfect place for anglers to pass on their passion and knowledge of fishing to the next generations of outdoor enthusiasts. And, it is a wonderfully secluded spot for lovers and nature lovers to share a few golden moments together. In his own publication, the Wilshire Magazine, Wilshire called the mine the “World’s Greatest Mine” and declared that the “Tip Top” claim was a “mountain cliff of solid ore.” Under Wilshire’s direction the company made extensive improvements to the property to house and support miners and their families. New mining equipment and technologies that were state-of-the-art at the time were constructed and installed. Wilshire also incorporated a separate milling company and further development of the property was made so that the ore extracted here was processed onsite. The mine was closed down on many occasions for issues ranging from heavy winter snowfall to seasonal flooding to a charge of stock fraud against Wilshire, a charge that was subsequently withdrawn. Unfortunately, Wilshire was never able to fully realize his dream of making the mine profitable and, after his death in 1927, the mine was put into receivership. It was leased briefly to the Consolidated Metals Corporation, which also undertook considerable development of the property. They were also unable to make a profit and the mine was sold to the Cardinal Gold Mining Company in 1933. The mine continued to produce for 5 years – this time at a profit. 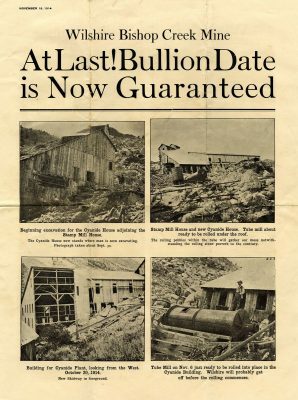 In its last eight months of operation, from Jan to Aug of 1938, the mine yielded 536lbs of gold, 155lbs of silver, and 4,395lbs of copper. It was considered to be one of the ten leading producers of gold in California during this period. In the total time of mining, the Wilshire Bishop Creek / Cardinal Gold Mine grossed about $1,600,000 in gold. The mine was considered to be extremely safe. All the management was committed to safety, and equipment was continually updated with some of the best available in the industry at the time. The working conditions were always good and employees were paid above average wages. It was agreed that it was one of the most scenic places to live and work. It is still an incredibly beautiful place to visit and stay for a few days. The Cardinal Village Resort pays tribute to these long-ago miners and their families, and the area has some of best hiking, fishing, cross-country skiing and photography opportunities in the Eastern Sierra. Fall is undoubtedly the loveliest season here. The changing colors of the forest, with sparkling blue lakes, and high craggy mountains that surround them is picturesque beyond belief. Spring is exciting too, as the melt produces tumbling waterfalls that cascade down the ravines. Exploration on foot is especially nice in summer and this is a perfect place to escape the heat of the valley floor. Winter is picture postcard perfect. Access to the lakes at the head of each fork of the creek is not possible by vehicle, but snowshoeing is definitely a great family outing on a crisp and bright winter day. The holiday season brings Santa and Mrs. Claus out to Cardinal Village Resort and family fun activities are extra special at this mountain resort. Getting to Cardinal Village Resort is a lovely 20-minute drive from Bishop along US 168 West (West Line St.) to the settlement of Aspendell. Turn right at Cardinal Rd and follow the signs to Cardinal Village Resort. Ask for your ‘Secret Map’ when you get there and go exploring up the canyon and see what you can find. It’s also a great spot for coffee, breakfast, and lunch. The wood-fired pizza dinner evenings on Fridays and Saturdays during summer and fall are a special treat, and reservations are required. If your adventure takes you up to Cardinal Mine please leave everything the way you find it so that others may enjoy this walk through history. You can take plenty of photos. Be careful. Stay safe. 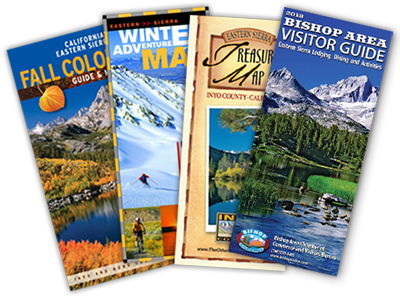 Pop into the Bishop Visitor Center at 690 N. Main St. or call us on (760) 873-8405 to get more information on this amazing place and many more in the Eastern Sierra.